Would you spend your day in a cemetery? 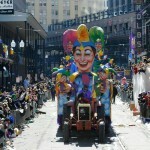 Perhaps only in New Orleans, because our “Cities of the Dead” command a closer look. 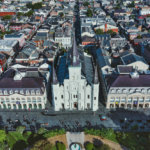 But for el Día de los Muertos, commonly known as the Day of the Dead, people traditionally visit the graves of their deceased ancestors much like New Orleanians do on All Saints Day. The Mexican holiday, (also known as Day of the Dead) is a celebration that originated from pre-Hispanic indigenous groups, like the Aztec (or Mexica), Toltec, and Nahua, of what is Mexico today. For these people, death was simply a continuation of life and not something to be mourned but instead celebrated. What we know today as Día de los Muertos is a fusion of these indigenous traditions with the Catholicism of Spanish conquistadors. On Nov. 1 and 2, All Saints’ Day and All Souls’ Day in the Catholic Church, the dead come back to visit the living, welcomed back with altars, or ofrendas which literally means “offering.” These altars are typically covered with the deceased’s favorite foods, pan de muerto (bread of the dead),flowers and photos, and drinks to welcome them back to the land of the living after their long journey. 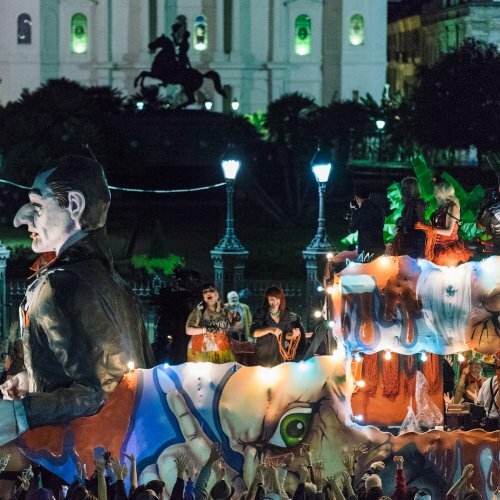 Over the course of many years, this holiday has disseminated from Mexico and taken up residence in New Orleans and other places around the world as something of an alternative to Halloween, though very different in nature. Whether you are interested in another culture or getting back to your roots, immerse yourself in Día de Los Muertos at one or more of the many events around the city. 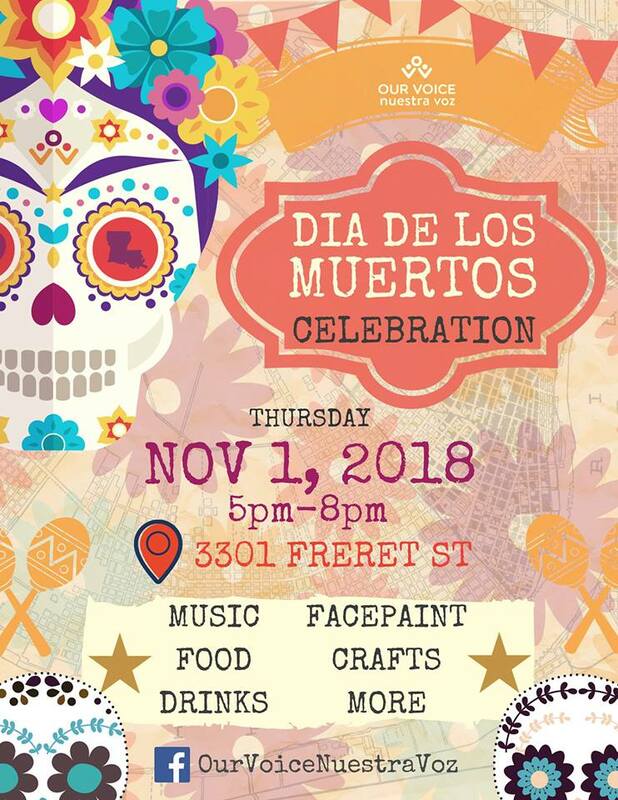 Thursday, November 1 from 5:00 to 8:00 p.m.
Nuestra Voz NOLA, an education advocacy group for Latino parents, is throwing a Day of the Dead party this year at their office on Freret Street. Admission to the event is free. This all-ages party will feature food and drink, music, a Day of the Dead altar, and a screening of Coco. Face painting and a bounce house round out the event, offering an exciting evening for adults and children alike. Thursday, November 1 from 5:30 p.m to 11:15 p.m. 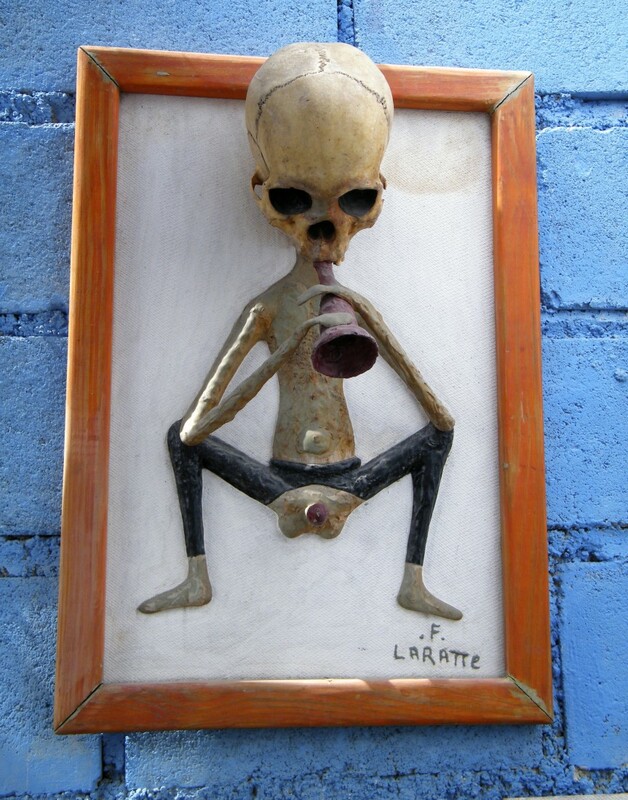 The New Orleans Healing Center’s annual celebration fuses Day of the Dead with a Vodou (Voodoo) ceremony for Gede, a family of Haitian Vodou spirits, who are the patrons of the Dead. The event is free and open to the public, and attendees are encouraged to bring a dish for the potluck and photos of recently departed loved ones to add to the main altar. Local Vodou priestess Sallie Ann Glassman leads the evening’s ceremony. The event includes art, multiple altars (including a Day of the Dead altar, a candle altar, an ancestor web, and an All Saints’ altar), and a potluck dinner. Requested attire is white with purple head scarves or purple and black, Gede’s colors. A procession to feed the dead ends the night. More information about the event can be found here. Thursday, November 1 from 3:00 to 9:00 p.m. This year, Del Fuego Taqueria hosts a Day of the Dead celebration. 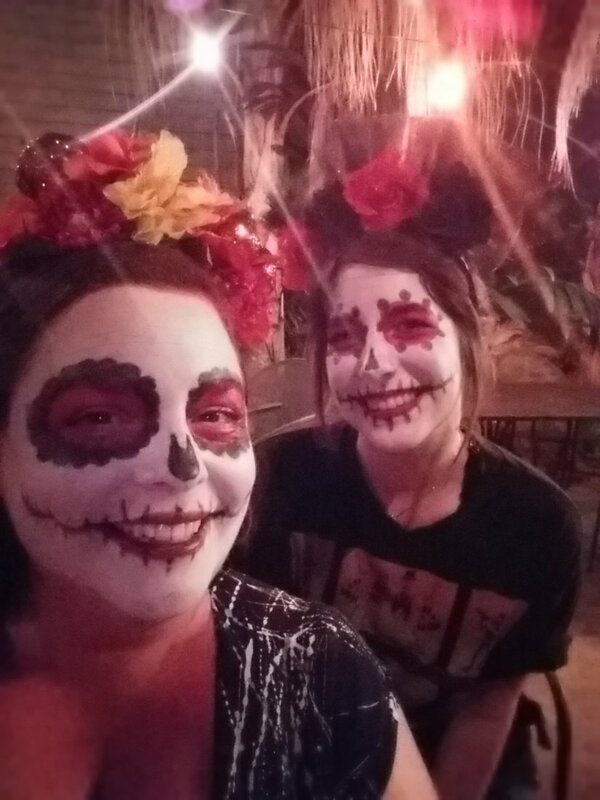 Look for happy hour specials from 3:00 to 7:00 p.m. with the event running to 9:00 p.m. Come enjoy sugar skull decorating and face painting. In keeping with tradition, an altar will be in display. All are encouraged to bring photographs of departed loved ones to add to the altar. Friday, November 2 from 7:00 p.m. to 11:00 p.m.
Casa Borrega hosts its sixth annual Day of the Dead masquerade party with music by Javier Gutierrez and Viváz. New this year is a Frida Kahlo costume contest with prizes. 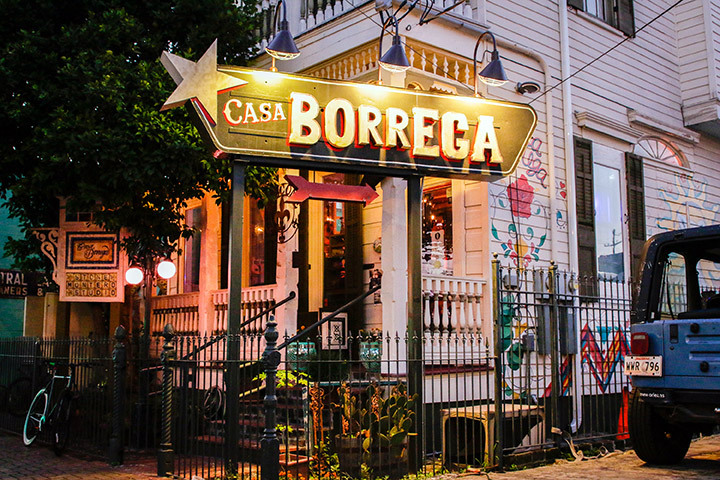 First place receives a gift certificate for dinner for two at Casa Borrega, second place receives a bottle of Tres Agaves tequila, and third place, lunch for two. The event is free, but authentic Mexican food and drink specials will be on sale, including mole and pozole, smoky mezcal diablos and vampiros (tequila, grapefruit soda, and sangrita), as well as hot, spicy chocolate spiked with mezcal. Co-owner Hugo Montero will design an altar de muertos in honor of Anthony Bourdain, which will be on display beginning October 19. Photos of deceased loved ones are welcome additions to the altar. Mexican-themed costumes are encouraged. Sunday, November 4 from noon to 6:00 p.m. The Hispanic Chamber of Commerce of Louisiana’s inaugural Día de los Muertos Festival takes place at the New Orleans Baby Cakes Stadium. This family-friendly event is meant to bring awareness to the Día de los Muertos tradition. Enjoy food, music, crafts, and shopping from local vendors. Day of the dead costumes and painted faces are encouraged, particularly for the costume contests (for both kids and adults). All are invited to participate in the community ofrenda by bringing something that represents a deceased loved one.